A double major in history and political science at Northwestern, Connor was accepted into six law schools. He chose to continue his education at the University of Minnesota and is leaning toward working in health law. 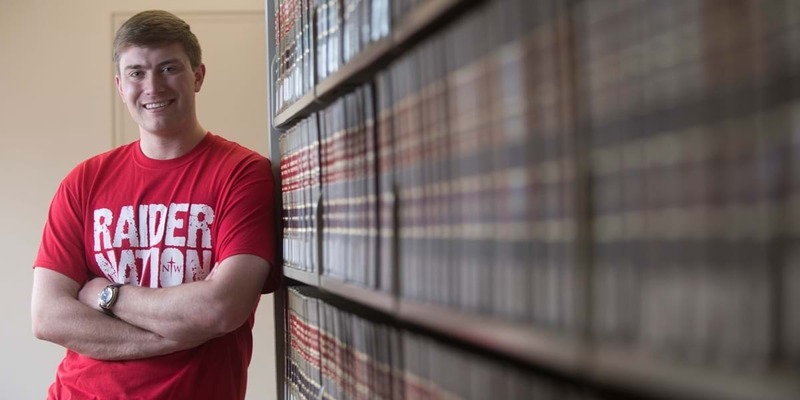 He credits Northwestern for his strong preparation for graduate school and appreciates how professors and alumni continue to offer guidance as he pursues his career as an attorney. Why did you decide to pursue a law degree? I always knew I was interested in law, but I finalized my decision after taking Dr. Jeff VanDerWerff’s American Government 101 course my freshman year. Northwestern helped me realize that even if the law is constantly changing, precedent plays a huge part in courts deciding what the law is today. A law degree simultaneously captured my two passions of history and political science, so I was instantly hooked on this challenge. I left Northwestern that semester knowing the law is where my passions meet this world’s need. What did you appreciate most about your Northwestern education? I was the opposite of “another statistic” at Northwestern. Professors and classmates truly cared—and still care—about my growth. From reading over my freshman papers and trying not to wince, to editing personal statements for law school applications, Northwestern professors were always in my corner. Additionally, Northwestern’s environment continues after you walk across the stage as evidenced through the regular advice I receive from former classmates attending other law schools and alumni practicing law throughout the world. How would you describe Northwestern professors? Northwestern is home to the most dedicated, caring and outright brilliant teachers I’ve had. Without them, law school would simply not have been a possibility and the decisions I have made about my career would have been much more complicated. I have appreciated their guidance since freshman year and continue to rely on them when concerns arise. The political science and history departments feel like family. How did your Northwestern education prepare you for law school? Saying Northwestern equipped me with the sufficient tools for law school is an understatement. My majors in history and political science represent the exact type of work I am doing–that is, researching the history of the law and determining how it applies to a given political context. The research and political application tools I gained at Northwestern have proved indispensable through law school thus far. My time spent researching projects, reading various texts and writing numerous papers more than prepared me for the rigors of law school. Being prepared to not just give an answer, but to articulate my reasoning and to address counterarguments is a vital law school skill, and Northwestern teaches that from day one. What do you hope to do in your career? Currently, I am interested in health law, including both public and private sectors. However, a law degree is extremely versatile and I can see myself working in a variety of settings. What is for certain is that I want to pursue God’s redeeming work by utilizing the skills I am learning here at Minnesota Law. Whether representing indigent individuals in court or drafting a contract, I intend to reflect God’s love to the best of my ability—something Northwestern taught me to aspire to. Tell us about one of your favorite Northwestern memories. Engaging in life-changing discussions that I never thought could exist in a classroom before I attended Northwestern.